Mango Shrikhand is one of the delicious, traditional Indian desserts. Shrikhand is basically made with strained yogurt or hung curd, fine sugar and flavored with cardamom or saffron. Mango shrikhand or Amarkhand is made by adding Fresh Mango puree to the basic Shrikhand recipe. 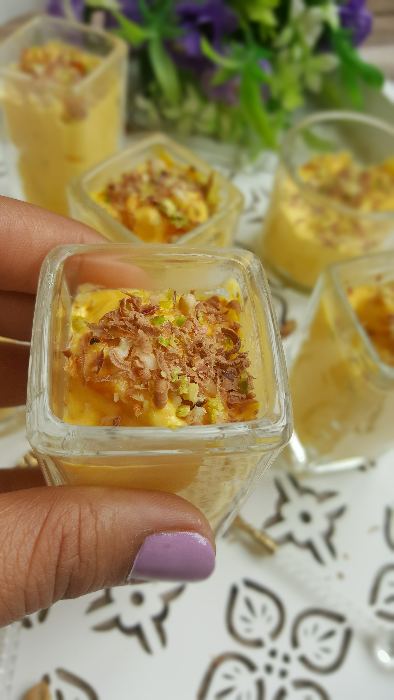 One of the easiest Mango dessert recipes that can be made in no time. 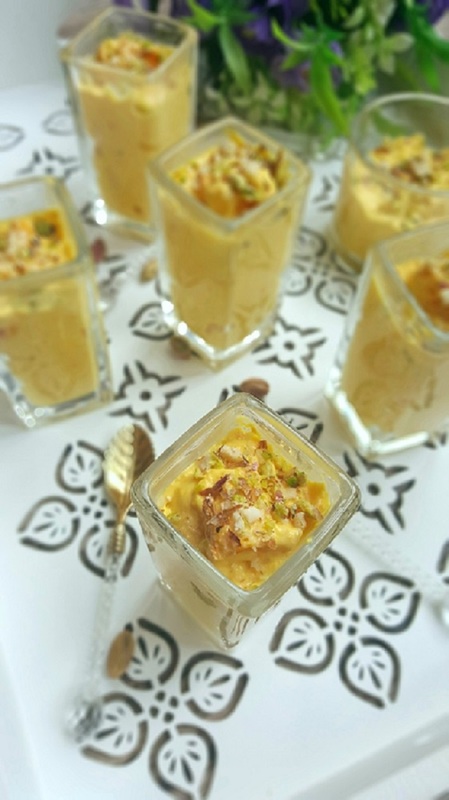 A Concept of Happiness and being sweet can be perfectly learned from a well known gujarati sweet dish Shrikhand.Despite being streched and strianed for hours, Yogurt turns into a rich and delicious dessert. A sweet dish coming from sweet people like gujaratis absorbs several flavors like mango, saffron and cardamom and still maintains its own richness. Although there is no known fact about the origin of shrikhand but it is said that the travelling herds man used to hang their curd or yogurt ovenite to make it smooth and easy to carry. During the day they used to mix sugar and nuts to make it palatable. Many Shrikhand Rcipes which I have checked online are made of Homemade yogurt , I have used readymade yogurt here.This one is real easy dessert recipe only time consuming is making hung curd over night. I like to Serve this lucious treat with some grated Chocolate on top and it is surely Crowd pleasing !!! Take a muslin cloth and spread it on a big bowl. Pour the curd in the cloth. Now bring the ends of the cloth together and hang it on a support to drain the water from the curd. Once the hung yogurt done , it will discard all water thru the cloth and will form thick curd. Mix thick curd with remaining ingredients. Mix it nicely to make it smooth. While serving it layer it with fresh Alphanso chunks in serving glass. Garnish with Grated Chocolate and almond pistachio crush.